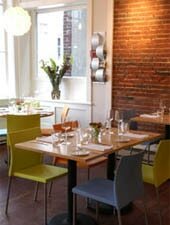 Historic New England port town is a good setting for this casually chic farm-fresh bistro. : Local, organic and fresh is the mantra at Solo Bistro, and everything is made in-house. Start with the daily special soup, locally grown-beet salad or Otter Cove oysters, then move to pan-crisped gnocchi with mushrooms, farm greens, porcini cream and pine nuts or the squash risotto. For those leaning more toward meat or seafood, the pan-seared day boat scallops accompanied by blue cheese grits, wilted greens, spicy piri piri sauce and garlic chips are a great bet, as are the hanger steak and the burger with goat cheese, both of which come with fries. Desserts present a tough choice: vanilla crème brûlée with sea salt rosemary shortbread, or espresso chocolate pot de crème. Take advantage of the nightly three-course prix-fixe meal for under $25, on Wednesdays $17.99. The beer list offers predominantly local brews, while wines include quite a good selection by the glass or bottle.